It is a special time of grace dedicated to forgiveness of sins , reconciliation and conversion . It can be ordinary and extraordinary . The last Holy Years extraordinary on twentieth century were those of 1933 , proclaimed by Pius XI , and 1983 , convoked by John Paul II . Below John Paul II inaugurated the Holy Year of 1983 , on March 25 . The ordinary one is bound to fixed deadlines , while the extraordinary is held in connection with certain events of particular importance and its duration varies from a few days to one year . The custom of calling extraordinary Jubilees dates back to the sixteenth century , and the last Holy Years extraordinary twentieth century were those of 1933 , proclaimed by Pius XI for the nineteenth centenary of the Redemption , and 1983 , convoked by John Paul II for the 1950 years of Redemption . Wojtyla inaugurated it with the bull Aperite portas Redemptori 25 March 1983. Objective : to emphasize the centrality of the mystery of the Redemption as an engine of faith and solemnly open the Church's journey to the Great Jubilee of 2000 . The jubilee year was extended to all the dioceses in the world and while in St. Peter opened the Holy Door , in all the cathedrals of the world was celebrating a special rite of penance and prayer . The practice of extraordinary jubilees , proclaimed to get a special divine help in difficult or sensitive issues of the universal Church and the local churches , or on occasions of special solemnity as the beginning of a pontificate , is old , and dates back at least to the sixteenth century . The extraordinary jubilees are celebrated in some places , for example in Santiago de Compostela in the years when on July 25 , feast of St. James the Apostle , falls on a Sunday . The origins of the Jubilee date back to the Old Testament. In fact the word " jubilee " comes from Jubilaeum which in turn is derived from the three Hebrew words Jobel ( ram ) , Jobil ( call ) and Jobal ( remission ) . In Chapter XXV of Leviticus , in fact , the Jewish people are encouraged to sound the horn ( Jobel ) every forty-nine years to call ( Jobil ) people all over the country , declaring holy the fiftieth year and proclaim remission ( Jobal ) of all residents. In the Old Testament the Jubilee was carrying the general release from a state of misery , suffering and marginalization . So the law stated that in the jubilee year not to work the fields, all homes purchased after the last Jubilee would return without compensation to the original owner and that the slaves were freed . Jesus transformed the precepts of the Jubilee Year in a great prospect ideal , in which emancipation , forgiveness and the beginning of a year of grace of God took on a new meaning . One Saturday in fact, Jesus explained that he was the Messiah spoken of in a passage of Isaiah , and that day was about to begin the salvation and the " fullness of time " . So today the Jubilee refers to the mission of Christ and his followers . In this way Christianity give the Hebrew Jubilee fuller and deeper meaning . 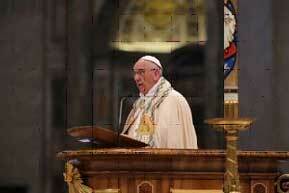 This fact is a general pardon , indulgence open to all , that the Pope grants under certain conditions to the faithful . It is therefore based on the value of indulgences and the power that the Church has to give . Throughout the history of the Church 26 Jubilee have been celebrated including the last in 2000 . 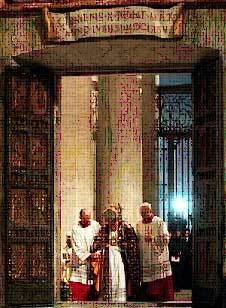 The best-known rite of the Jubilee is the solemn opening of the Holy Door : This is a door that is opened only during this time , while in other years remains walled . They have a Holy Door the four major basilicas of Rome : St. Peter, St. John Lateran , St. Paul Outside the Walls and St. Mary Major . 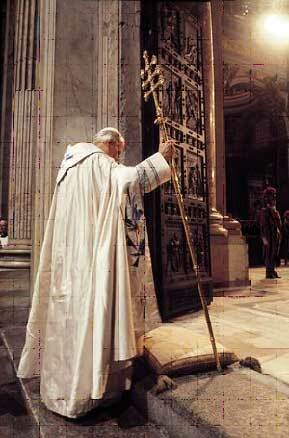 The rite of the holy door , symbolically expresses the idea that , during the Jubilee , " extraordinary journey " toward salvation is offered to the faithful. WHEN CELEBRATES JUBILEE OF MERCY ? Proclaimed by Pope Francis through the papal bull Misericordiae Vultus . Previously announced by the pope March 13, 2015 , began the December 8, 2015 and ends November 20 , 2016. The Pope said the Jubilee , during the fiftieth anniversary of the end of Vatican Council II , it will be dedicated to Mercy . Here is the announcement made by the Pope : "Dear brothers and sisters , I have often thought about how the Church can make clear its mission of being a witness of Mercy . It is a journey that begins with a spiritual conversion . So I decided to hold a special Jubilee that is focused upon the mercy of God . This Holy Year will start the forthcoming Solemnity of the Immaculate Conception and will end on November 20, 2016, Sunday of Our Lord Jesus Christ , King of the Universe and living face of the Father's mercy . I entrust the organization of this Jubilee to the Pontifical Council for Promoting the New Evangelization , so that it can animate it as a new stage of the journey of the Church in its mission to bring everyone the Gospel of Mercy "
HOW TO OBTAIN THE JUBILEE INDULGENCE ? 4 ) carry out a work of penance ( abstain from unnecessary consumption , fast ... ) .